In my mind, nothing beats the smell of freshly baked bread. When I first tried this recipe for no-knead bread, I'll admit, I was skeptical. A bread that doesn't require any kneading? No way. However, upon further inspection, and a trial run...the verdict: this is the real deal. Not only does this loaf look rustic and beautiful, it has a nice crunch crust and a tasty flavor to boot! This bread couldn't get a whole lot easier to make. Mix it up before you go to bed, and bake it the next evening just before dinner. If you want to have it for breakfast, just mix it up in the morning so it's all ready to bake before the next sunrise. One thing I love about this bread is that it doesn't get dried out. You can bake it in the morning and don't need to worry about wrapping it up. It's a great bread to give as gifts for housewarmings, hostess gifts, or holiday parties. Step Two: Mix all of the dry ingredients together in a large bowl. Step Three: Add the water and almond extract into the dry ingredients, mix well to combine. Cover with plastic wrap and place in a warm draft-free space. Now wait 12-18hrs before baking. A TIP: It is to your benefit if you have a dutch oven, or lidded bread baker, but you could improvise and use the insert of a round crock-pot and cover with aluminum foil if you don't. A word to the wise: make sure you check to make sure whatever you use for baking is rated for temps up to 450 degrees. Step Four: Preheat a Dutch oven for 30 minutes at 450 degrees. Meanwhile, pour out the dough onto a heavily floured surface and form into a ball. Cover with plastic wrap until Dutch oven is preheated. Drop into the Dutch oven, cover with lid and bake for 30 minutes. Remove the lid, and bake for an additional 15 minutes. Allow bread to cool on a wire cooling rack before serving. If you're feeling generous, you could even share a slice or two with your friends, neighbors or coworkers! In a large mixing bowl, whisk together flour, salt, yeast, cranberries, almonds, orange zest. Add water and almond extract. Mix until well combined. Cover bowl with plastic wrap and set aside for 12-18 hours in a warm draft-free spot. Overnight works great. Preheat oven to 450 degrees. Place Dutch oven with lid in the oven, and heat for 30 minutes. While the dutch oven preheats, pour dough on a heavily floured surface and shape into a ball. Cover with plastic wrap until Dutch oven is preheated. Remove the Dutch oven, and drop in the ball-shaped dough. Cover, and return to oven for 30 minutes. After 30 minutes, remove the lid and bake an additional 15 minutes. Remove bread from oven and Dutch oven. Allow to cool on a wire cooling rack before serving. 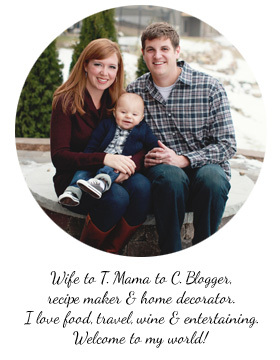 On another note, have I mentioned how completely and utterly enamored I am with the True Food cookbook? I absolutely can't get enough. Thank God for the library, or I may have never discovered this wonderful jewel of a cookbook! Written by a group including a restauranteur, chef and physician, these guys have it together when it comes to healthy, sustainable, simple seasonal eating. It has recently been nominated for Best 'Focus on Health' Cookbook by the James Beard Foundation. Serious stuff, and deserving of the award. For a complete list of other James Beard finalists CLICK HERE. Meanwhile, if I ever find myself in a town with a True Food Kitchen restaurant, you'll know where to find me. Step Two: Mix together the dressing. 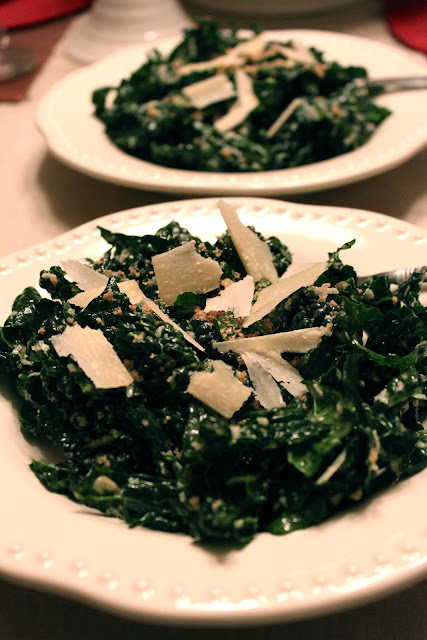 Add the chopped kale, toss, and allow to rest at room temperature for 10-30 minutes. After resting, add grated Parmigiano-Reggiano and bread crumbs, toss. Garnish with Parmigiano-Reggiano shavings. *NOTE: I recommend Tuscan kale, but whatever you can find will work. The kind I used was labeled 'Lacinato' kale, but it can also be called black kale, cavolo nero, Russian kale, or dinosaur kale to name a few. In a large salad bowl, whisk together the oil, lemon juice, garlic, salt and red pepper flakes. Add the kale and toss well to coat. Let the salad sit at room temperature for 10-30 minutes. Add the grated cheese and bread crumbs and toss again. Garnish with the Parmigiano-Reggiano cheese shavings before serving. Leftovers can be covered and refrigerated for up to 2 days. Stop right there. You have no need to look any further for a morning muffin that packs more nutrition or flavor than the one I'm about to tell you about. That's right, this muffin contains no added sugar. Seems crazy right? Think again. I was completely blown away when my lips met with the delicious sweetness of coconut, honey, bananas and dates mixed with the unmistakable crunch of carrots and chopped walnuts. I warn you. Once these muffins cool enough to eat, you will have a hard time stopping yourself from going back for a second or even a third! Step One: Gather the ingredients. Prep the carrots, dates and walnuts so they are ready to go when you need them. You could use a small food processor with a grater attachment if you want. For the amount of carrots that need shredding for this recipe, I didn't think the clean-up was worth it, and decided on a handheld grater. WARNING: Chopping dates takes a while, and your hand will be tired...and if you are like me, may cause blisters. Be careful! Good news is, you can buy chopped walnuts, and you don't need to get them any smaller than they already come. Step Two: Combine the wet and dry ingredients, then bake in lined muffin cups in an oven preheated to 325 degrees for 25-35 minutes. Now is the time to get that coffee going if you haven't already! Once cooled to the touch, be prepared to be wowed as you take your first bite! 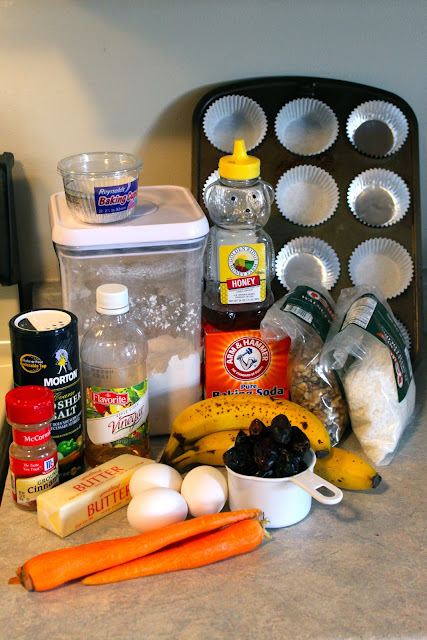 CARROT-BANANA MUFFINS | Yield: 12-16 muffins | Total Time: 1 hr. 15 min. *NOTE: If you can't find dates, you could try substituting raisins, candied ginger, dried apricots or cranberries for a similar taste and texture. Preheat the oven to 325 degrees. Line a muffin tin with paper liners, or lightly spray with cooking oil. In a large bowl, mix together the flour, baking soda, salt, cinnamon and coconut. In another bowl, whisk together the mashed bananas, eggs, unsalted butter, honey and apple cider vinegar. Stir the wet ingredients into the dry ones. 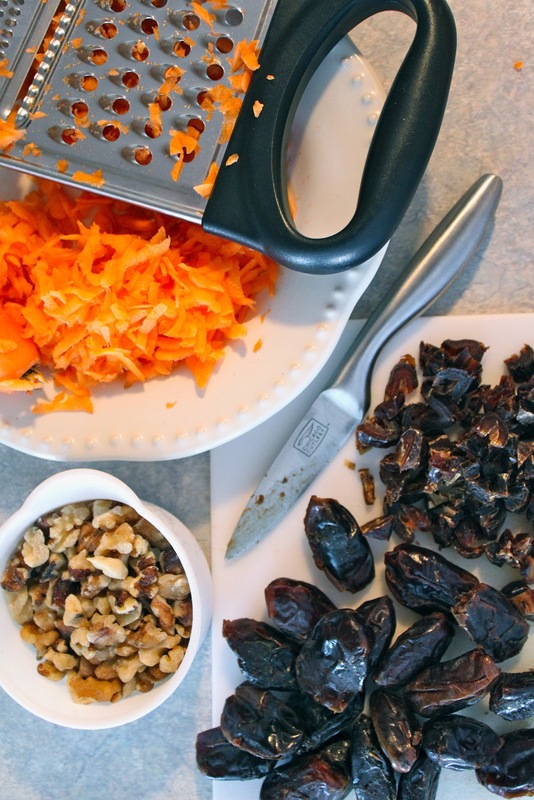 Fold in the chopped dates, shredded carrots and chopped walnuts. Divide the batter among the muffin cups. Bake for 25-35 minutes, until tops are golden brown and a skewer inserted into the middle of a muffin comes out clean. Cool in the pan for 5 minutes before transferring to a wire rack. Do you have any healthy muffin recipes that incorporate fruits and veggies? Good morning! I hope you all had a wonderful Easter weekend! T and I made a quick trip to Okoboji over the weekend and actually got to spend some time outside without coats if you can believe it! Sixty degrees and sunny is much more to my liking than the perpetual 30 degrees we seem to be stuck in. No, the ice still hasn't melted...but it's getting close! The few stragglers still trying to ice fish are going to be lucky if they don't fall through. The lake only had a few inches of ice left, and the shoreline was open water. You wouldn't be catching me on it, thats for sure! Anyways...enough about my weekend. If you enjoyed turkey for Easter Sunday, you may now be wondering what to do with all of the leftovers. Never fear. I have a wonderfully delicious recipe for you to cook up in your slow-cooker. Yep - SLOW COOKER! Slow cookers are wonderful because they can take some of the worry off and give you a little free-time to accomplish all those other things on your list of to-dos. Set it and forget it! If you use a slow-cooker liner, the cleanup is even more simple. Step One: Gather the ingredients. Heat a large skillet over medium high heat, and saute the carrot, onion, celery and garlic for approximately 10 minutes, or until the onion becomes translucent. Step Two: Combine the broth, wild rice & seasoning packets, sauteed veggies, 1/2 tsp black pepper and turkey in a slow cooker. Top with sliced mushrooms, and set to low heat for 3.5 hours. Step Three: 20 minutes before serving, add peas. Meanwhile, melt butter in a saucepan, whisk in half & half, flour and remaining seasonings. Step Four: Add half & half/flour/spice mix to the slow cooker, stir well to incorporate. In a large skillet, heat oil over medium heat. Saute the diced onion, carrot, garlic and celery for 10 minutes, or until the onion is transparent. Meanwhile, combine 4 C chicken broth and 8 oz. uncooked wild rice with seasoning packs in a slow cooker. Pour the remaining 4 C chicken broth over top. Add sauteed vegetables, turkey, chopped mushrooms and 1/2 tsp black pepper, stir. Cover and cook on high for 3-4 hours (or low for 6-8 hours) until the wild rice and veggies are cooked through. Stir in peas during last 20 minutes of cooking. After adding peas, melt butter in a saucepan over medium heat. Add half & half, whisk in flour 1/4 C at a time. Whisk in 1/4 tsp cayenne, 1/4 tsp black pepper, and 1/2 tsp Italian seasoning. Add to slow cooker, stirring to combine. Add an additional cup of water or broth here if you prefer a thinner soup. Continue cooking on high for an additional 15-20 minutes until heated through. Serve with oyster crackers. What did you make for Easter?